HARDEE COUNTY, Fla. — Troopers are searching for a driver in a white Dodge Ram pickup truck they say hit and critically injured a Harley Davidson rider Saturday. Troopers released a photo of the actual truck Wednesday morning (pictured above). 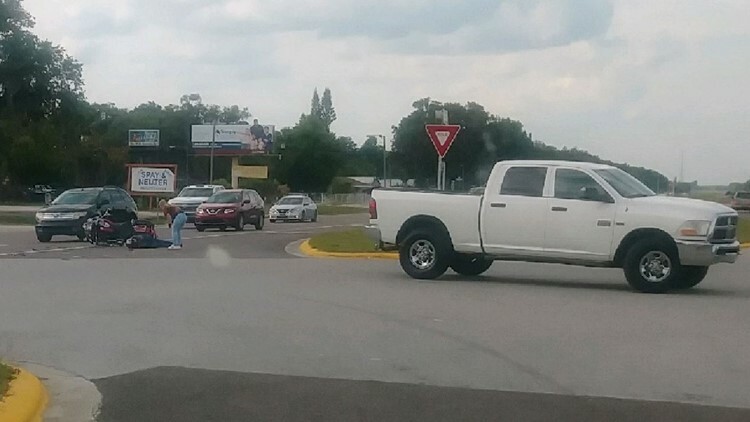 The Florida Highway Patrol says the unidentified driver of the Dodge Ram was driving in the parking lot of La Tienda De Los Primos on US 17 before crossing in front of the motorcycle. The motorcycle had the right of way, troopers say. The front side of the motorcycle hit the left side of the Dodge and the 82-year-old motorcyclist was sent to the Lakeland Regional Hospital for critical injuries. The driver of the pickup truck drove away from the scene of the crash on northbound US 17, FHP says. Witnesses of the crash describe the driver as a Hispanic male and the truck as a white, four-door Dodge Ram pickup truck. Anyone with more information is asked to contact FHP at (239) 938-1800 or Crimestoppers.